That 3BH is an offset but into what? I did not know, therefore dedexer does not interpret the offset which makes its output on ODEX files less useful. Then Nenik (nickname according to his request) finally gave me the solution. Here comes his mail, verbatim. The index computation is pretty simple, but for reverse analysis you need more data. all nonprivate member methods (even those final and native). overridden methods and appending all additional virtual methods. The methods in the vtable are ordered as they were in the dex file. to reconstruct the vtables of all the base classes. 00498D30 65 77 6F 72 │ 6B 2F 63 6F │ 72 65 2E 6F │ 64 65 78 00 ework/core.odex. 00498D90 08 80 01 00 │ 00 20 00 00 │ 00 00 21 AA │ C2 5C 31 00 ..... ....!ªÂ\1. .odex format, something I would like to be able to do. Thanks, Nenik, this is the information I needed to improve the dedexer tool. I will do that soon. If anyone has something to add, please, comment. I have reviewed two Android books recently and now, that both are in press, I decided to write some words about the experience. 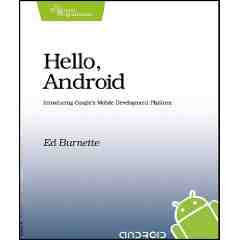 The first book is Ed Burnette's Hello Android (The Pragmatic Programmers, ~22 USD). The other book is Unlocking Android from Ableson, Collins and Sen (Manning, ~29$). This book definitely has higher ambitions. It is longer than the previous one (~400 vs. ~200 pages) and expects sequential reading. Beside the usual topics, it ventures into such exotic areas like Linux-level programming in C in the Android environment. Curiously, this breadth of topics means that the Manning book deals less with UI-programming than Burnette's book (82 pages in the Burnette book vs. 62 pages in the Manning book).The Manning book does provide, however, a detailed view of Android programming model. 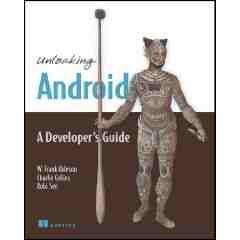 It discusses Android services extensively and even presents, how to write a content provider (although not in detail). To summarize, the two books follow different concepts. Burnette's book is, erm, pragmatic. It tries to make the reader productive as quickly as possible using the most common application type, the UI-intensive standalone application, with some web programming thrown in for good measure. Meanwhile, it omits a great deal of Android architecture. The Manning book builds systematically, by presenting the architectural concepts in detail. Decide yourself, which one suits you most. I enjoyed reading both.